Nate R. from HQ’s Product Team is watching the thread to answer questions whenever possible. I believe it's showing the most favorited caches in the whole world. And most of them just happen to be around HQ. I think the new homepage looks better than the prior version. I can now see the three quick searches without having to scroll down the page. I like that less vertical scrolling is required. One thing that seems buggy is the way the 'Most Favorited' quick search results are presented. These results are 'squeezed', with whitespace padding the sides of the results. This padding doesn't appear with the 'Events' and 'Newest caches' quick search results. See image below. 'Newest caches' (top) displays the full screen width. 'Events' (not pictured) appears the same way. But then 'Most Favorited' (bottom) displays in a much narrower fashion, with even the dates text wrapping. I thought it was supposed to be around the user's home location? I'm in Seattle, so hard for me to notice if it's an issue or not. The URL contains "/play/search?origin=home&radius=30mi". If that's what's showing in ChileHead's URL, then I'd think that means it should be using his home location as a center point? Hi, all! I'm Nate, the PM on the project and fairly recent new addition to the Geocaching team. I hope you all like the changes to the homepage — not only does it hopefully help with faster navigation around our site and content, but it also lays the groundwork for the page to be more dynamic and fresh. I truly appreciate all the feedback or reports of issues, so keep 'em coming! Thanks for the help on this! We will be pushing out a fix for this shortly with the intention of it centering on your home location, with a radius of 30m. This is known and we are working on a fix. To my knowledge, it's only affecting searches based on your home location at the moment. Thanks for the heads-up, though! This is quite an improvement but I haven't used the homepage much, so I'm not sure that it will make much difference to me. The Most Favourited link takes me to a list of 30,000+ caches, the first thousand of which are all in Oregon (maybe the rest are too - I can't tell). To be useful this really needs to be focussed on my local area - either where my home is, or where I am now. "viewing geocaches near you on the map" is still not at the new dashbord like before at the old one but still needs two more clicks. This is one reason why I prefere the old page. The “What’s new?” section is nowhere to find. Should it be at the new dashboard? The "What's new?" section is nowhere to find. Should it be at the new dashboard? "Whats New" is located bottom right. I don't really see the improvement on the search page. Including quick searches for events or favourited caches around me (if this at least would work properly) is not a priority for me and was easily done with a filter in the past, but READABILITY is and this padding of blank space on the right and left making the lists smaller and several columns narrower than they need to be (hiding and found dates are now broken into two lines!) is very disturbing. Why don't you test things first, before making changes public? I know from a previous post that you are working on a fix, so looking forward to this happening soon. P.S. : What is the point of fixing a radius (30km ?) for those new quick searches, when the old method using a filter let me adjust this radius and search around any location? I understand coders code to bigger and better but there needs to be a common sense person at the top to place limits. I clicked the "Most Favorited" link and it gave me 31,550 choices. If I sorted on the low end of distance I had to scroll for 10 minutes through 0 favorites until I gave up, if a cache has 0 favorites is it a favorite? I predict Geospeak will implode under the weight of making things "better". On a related issue, this padding effect is indeed very strange. It occurs for certain searches but does not affect the new event quick-search. If I do a regional or countrywide search the padding occurs, but when I scroll down the list the headings move back to normal (old) width, i.e. columns get completely misaligned. The old quick searches had a fixed radius too, so the only thing that has changed is that the radius has been decreased. Personally, I find the new default radius of 30 miles for Events to be about right. I can't remember what it was previously, but I seem to recall that it was far too high. If you want to search with a different radius, you can click "Change filters" and change the distance just like before. It would be nice if the distance was configurable (and sticky). For someone in a cache-dense city, 30m might be too much. On the other hand, I live in a rural area 29m North of one major township and 33m South of the other. I just manage to get a few caches in the Southern town and miss out on the Northern one. 35 or 40 miles (say 55 or 60km) would suit me much better. This could then apply to all searches which have a "near to you" option, from the newsletter and the dashboard, for example. Howdy, Nate! Thanks for joining the party. You'll notice that your customers are hard to please. Don't fret, nothing personal. We b*tch because we care. Speaking of which, I'm wondering how hard it could be to finally add MEGA and CITO to the available filters on the homepage search? "Event" just doesn' suffice, I don't want to scroll through 50 ice cream socials just to find the next CITO in my 'hood! I've been kinda resigned to doing my searches and cache sleuthing via GSAK, or on project-gc.com. 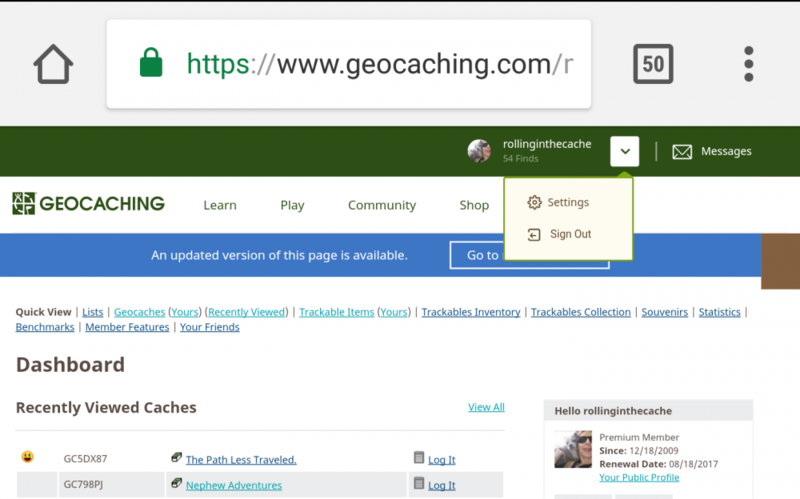 Using the API, they can do things that geocaching.com - even after years - still can't seem to figure out, in spite of having direct access to the backend?! to really show most favorited caches within 30 miles from home coordinates as g=48 restricts the search to 'In Washington, United States'. No, there are at least 9 caches in Germany with more then 3600 Fav-points (e.g. Lego - einer ist zuviel http://coord.info/GC13Y2Y currently with 8372). It would be nice if the distance was configurable (and sticky). For someone in a cache-dense city, 30m might be too much. lol, I just realized "30m" wasn't actually a typo. (at least, it appears to have been intentional). I'm Canadian. I understand miles in short to be "mi". hahaI just thought 30 meters was funny. Sitting in a hotel room on the wandering way home and trying to post notes for tb drops. the big map seems to be broken. Comes up like a page without a stylesheet and half of it is in <blink> mode. Little preview windows show blank on cache pages. This isn't really the place to report those bugs. This Release Notes thread is about the new home page. And those two things have nothing do to with the new home page. The title of this thread suggest that it is about the whole website. Just to be clear, release notes threads are for discussing features in the release. That's why we add the italicized "disclaimer" at the end of the OP. Bug reports unrelated to features in the release should go in the Website forum. Thanks! We've pushed out fixes for the Most-Favorited URL and the extra padding on search results for those focused on home locations. Thanks for all the help in identifying these issues! Even if I'm not responding, know that I do read all the feedback, so please keep the bug reports and edge cases coming! Thanks for the welcome! I love the team, the game, and the community here. I'm not going anywhere. An interesting idea. It's tricky to find a radius that works for most people and doesn't overwhelm with results, so maybe a setting makes sense. I'll keep this in mind — thank you! Thanks for the welcome! I'll keep this in mind as we discuss future search changes. I can certainly see how that would be useful, so thank you for the note. And believe me when I say that it's not an issue of "figuring it out," but simply resources. Haha, that's my mistake! Like many Americans, I'm metric-system-challenged and didn't consider the implications of leaving out the "i." 30m DOES seem too conservative in this context, lol. This is a little OT, but I'm curious as to whether this is consistently occurring for you. PM me with details, please, if so! "View geocaches near you" isn't anything I would need as the map search anyways is my personal default page when opening the browser. It would be easier to keep track of which release notes are about which features if the posts used the "Topic Description" to list the related features. Right now, they seem to use just the "Topic Title", and that is being used to specify only the affected component(s) and the date. When there are multiple release notes related to the same component(s), it can be a challenge to find the right one, even if you know that you should find the right one. Even better would be to have the affected feature right in the title. I use the "IP.Board Mobile" theme when viewing the forums on my phone, and it doesn't show the contents of the "Topic Description" field. "Release Notes (Website) - Homepage - July 5, 2017"
"Release Notes (Website) - Dashboard - June 20, 2017"
I can certainly see how that would be useful, so thank you for the note. And believe me when I say that it's not an issue of "figuring it out," but simply resources. Aye, there's the rub. I sure understand you can't do everything at once. But .... Clyde (master of eternal GSAK fame) and ganja1447 (amazing overlord of project-gc.com) both actually created and are maintaining their massively useful community tools WITHOUT the benefit of a steady income stream from Premium Members, trackable buyers, and lucrative corporate sponsors. As a chef, I would be seriously embarrassed if someone took an item off my lunch menu, and turned it into a stellar gourmet meal, at no extra charge. Nothing personal, Nate. Remember, we b*tch because we care. In the meantime, you can edit the URL of the search results from "...&types=6,13,453,1304,3653,3774,4738,7005..." to "...&types=13..." to only include CITOs and to "...&types=453..." to only include Megas. I bow my head in awe of your secret knowledge! Thank you, this actually works! Now, why would you ... No, never mind . Ah, working around the website. One of my favorite activities, particularly when navigation on something doesn't work or there's an annoying pop-up splash I just want to get around. For the most part I'm bookmarking pages so I can navigate the site faster. Been doing that for years. So much easier. Until they make certain pages/views only navigable by form postbacks... rgh. Hi. 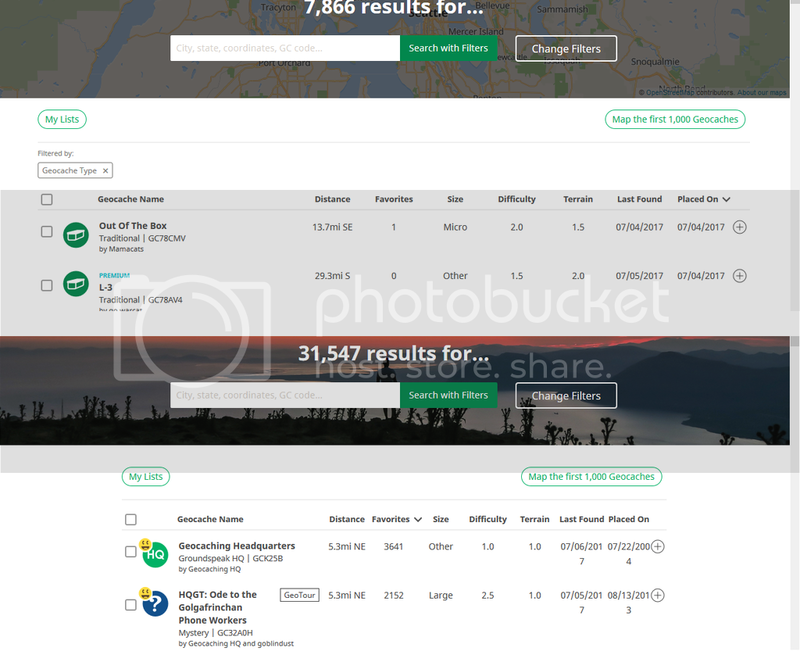 I hope this is in the proper area, apologies if not, but in terms of the website homepage, I really like the "Quick View" view of the dashboard because of the ease in finding things. Those places are hard to navigate to as is on PC, but in mobile its kinda luck of the draw if I get to a section. I have, sure that looks great. But if I'm on a trackables or a cach page for example, I can't get to it without clicking my name then reloading the first page. I'm hoping its easier to navigate such as a menu and sub-menus or it can be included in the tops of these areas LIKE the old version, for clarity. They won't change EVERYTHING at the same time (hopefully ). Right now they are working on the new dashboard as well as the logging page, earlier they changed the list page. And they already made a few changes to the cache page, too. catching up on the latest release notes ... Home Page ... why would I use this page with the exception of looking at events?